A New Commandment composed by John Ross. For Organ, Choral. Sacred, Christian, Easter. Early Intermediate. Score. Published by John Ross (S0.1203).For SABar and organ. Suitable for Maundy Thursday or for general use throughout the Church year.About Digital Print Sheet MusicDigital Print is printable sheet music available anytime, anywhere. Just purchase, print and play! View your online sheet music at home, school, work or anywhere you have a computer connected to the Internet. Use our iPad app to view your digital sheet music on the go. With Digital Print, you can print your digital sheet music immediately after purchase, or wait until its convenient. And our software installation is easy - we'll guide you through the simple steps to make sure you have Adobe Flash Player, Adobe AIR and the Sheet Music Plus AIR application. A New Commandment composed by Paul Carey. For SATB choir. 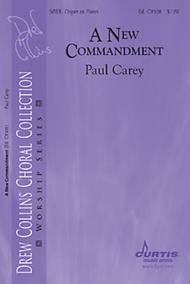 Drew Collins Choral Collections. Choral, Sacred. Grade 3. Choral octavo. 12 pages. 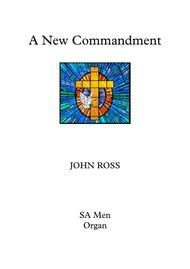 Published by Neil A. Kjos Music Company (KJ.C9308).for Mixed Chorus (SATB) and Solo(s) with Organ or Piano Accompaniment Lyrics from John 13:34-35 This anthem features a cascading melody over a lush bed of choral and keyboard harmonies. A soprano solo is heavenly suspended over a glowing choral sound announcing, "Love one another as I have loved you". A perfect setting of a beloved text (John 13:34-35).Recorded by the WSU Chamber Singers, Hank Dahlman, Conductor.